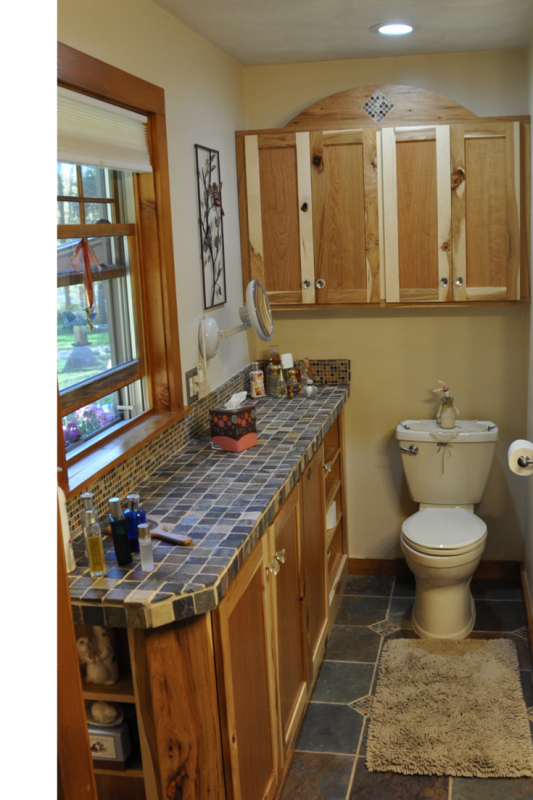 Custom Products and 3 Planning Tips make a Bathroom Remodel in New York Stand Out! 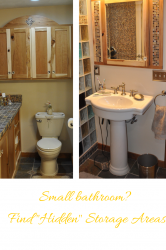 In many bathroom remodeling projects it’s neither practical nor cost effective to change the overall layout of the space (moving plumbing and walls can be expensive!) 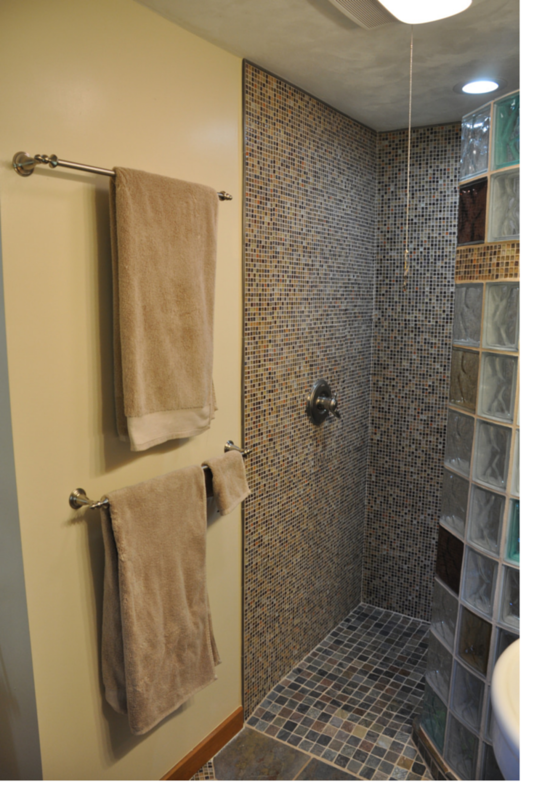 – but this is no reason to settle for a “common looking room.” In the article below learn how a design-oriented do it yourself homeowner used custom building products (including cabinets, slate tile and colored glass blocks), installation systems (a prefabricated glass block wall with a custom base) and 3 planning tips to not only transform the looks of a unique “L-shaped” bathroom – but increase it’s functionality as well! 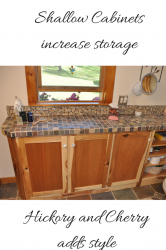 • Creating a long and shallow countertop – A custom built hickory/cherry cabinet from Vanderhoof Construction with 16” depth and drawers which slide out provided increased storage, better access and more countertop space. 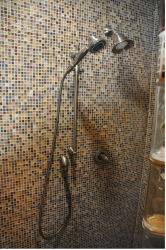 • Replacing a small fiberglass shower with a wider curved glass block shower – The old walls were framed to fit a standard 42” fiberglass one piece shower. 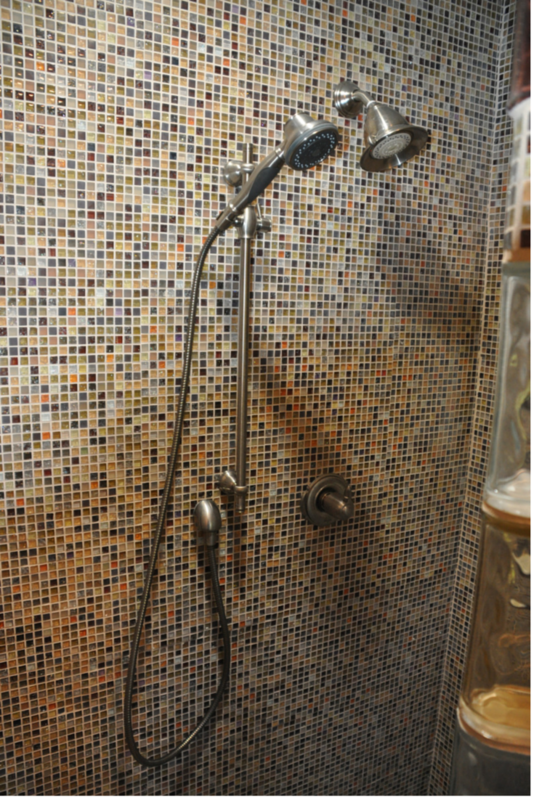 This homeowner reframed the opening and used a curved glass block wall to create an open walk in shower in a 60” wide area. 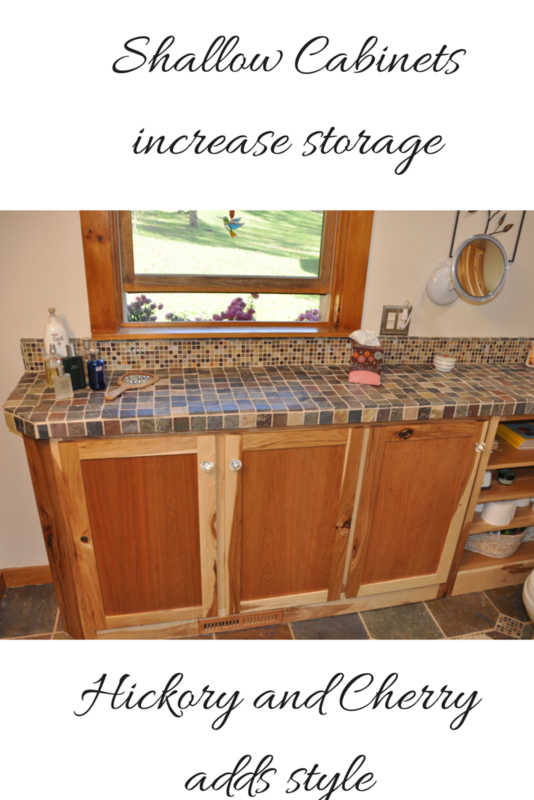 • Find “hidden” storage locations – A custom medicine cabinet and above the toilet storage cabinet increased storage without taking up any floor square footage – what a great idea! 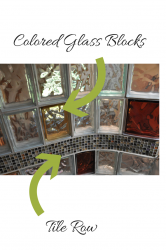 Planning tip #2 – Look for predesigned custom fabrication and installation systems – Trying to design and build a custom base which would match up perfectly with a curved glass block wall can be fraught with danger. 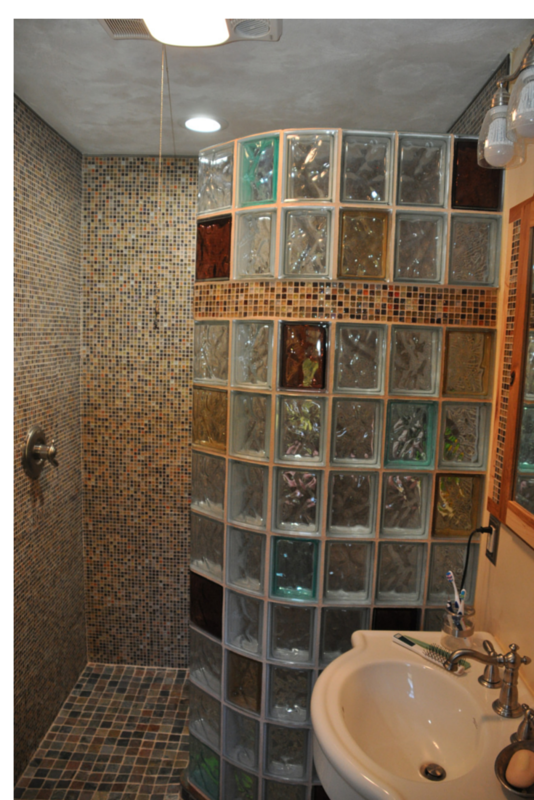 This homeowner chose to purchase a custom waterproof ready for tile shower base and a curved prefabricated glass block wall system from Innovate Building Solutions. 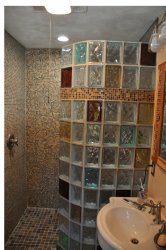 The space was designed with a sloped entry for safety and the glass block wall was manufactured in 2 block high sections and even included an expanded polystyrene backed tile row as an added design feature. 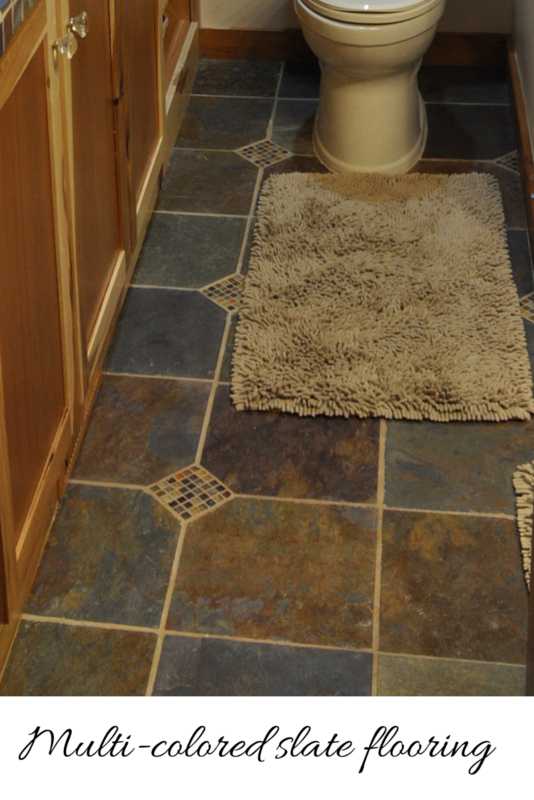 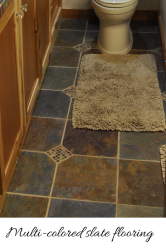 • Multi-colored slate tile – This selection provided a warm and soothing mix of colors. 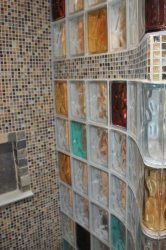 • Colored glass blocks – In order to create a nice blend of colors in the glass block wall to mix with the cabinetry and flooring the owners chose the seafoam, pinot noir and cinnamon colors from over 52 different color selections offered. 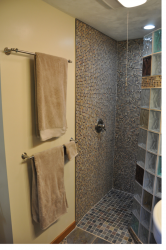 • Peppercorn mosaic tile installed in cabinetry, glass block row, shower walls and floor – The mosaic tiles were strategically used throughout the space to tie everything together. 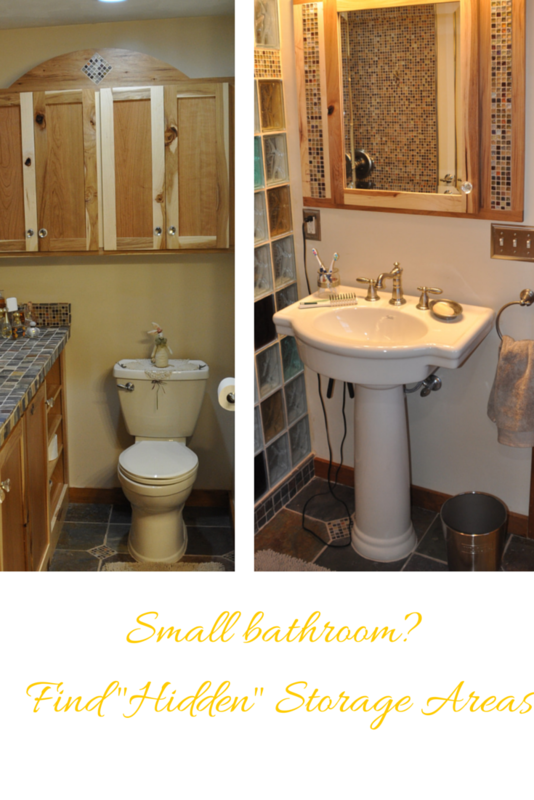 Even if you have an odd shaped bathroom (like the L shape of this bathroom) and don’t want to make any major structural changes this project proves a custom look (with the proper planning) is achievable. 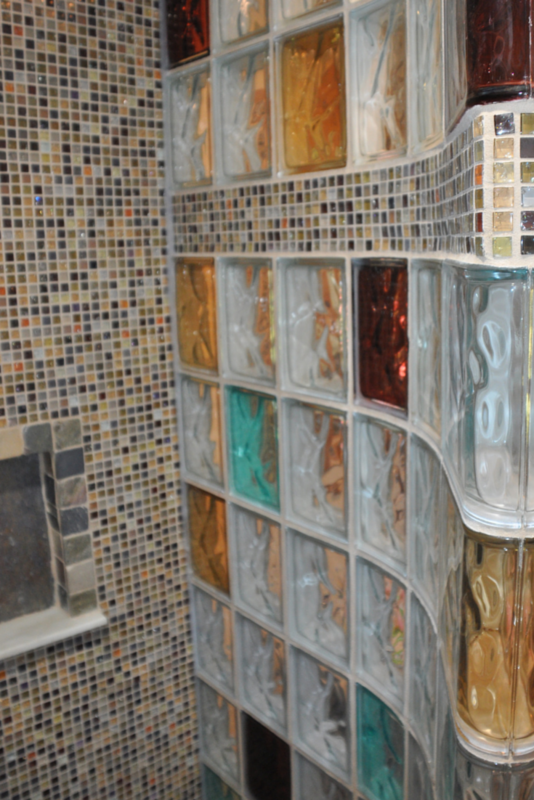 For assistance with custom glass block walls and bases call Innovate Building Solutions on a nationwide basis (877-668-5888) or for a local project their divisions including Columbus Glass Block (614-252-5888), Cleveland Glass Block (216-531-6363), West Side Glass Block (216-398-1020) or Mid America Glass Block (513-742-5900) of Cincinnati or Dayton and Akron (330-633-2900). If you need bathroom remodeling in the Cleveland area call Cleveland Design and Remodeling (216-658-1270).